An exhilarating production of the classic tragedy about devoted love and tormented seduction, featuring two richly lyrical leading voices. Tosca’s (Elena Stikhina) lover, Cavarandossi (Jonathan Burton), is helping his politically rebellious friend, Angelotti (David Cushing), and, as a result, is himself targeted for manipulation and eventual destruction by the evil Scarpia (Daniel Sutin). Tosca tries to get him out of the fix, but Scarpia, a lecher and manipulator, demands affections from her in kind to secure Cavarandossi’s release. 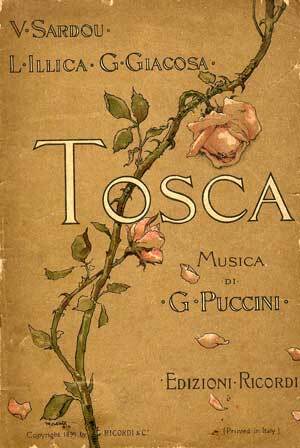 Embroiled in the harsh choices, Tosca follows her heart and seems to find a way to his release and liberation, but, as grand and tragic opera would have it, destiny trumps the plans. The BLO has done it again with stirring vocal performances in the leads, excellent musicianship from the podium and the orchestra, and a production which is trim, elegant and to the point. It’s amazing what the BLO pulls out of the proverbial hat one time after the other. The singing of the star, Russian soprano Elena Stikhina, is the big news here. What an incredible voice she has, and what wonderful musicianship she wields with it. That is apparent throughout, but her performance of Vissi d’arte (I lived for art), the famous second act aria, is so compelling, lush and delicately nuanced that it alone would be worth the price of admission. Stikhina, a 2012 graduate of Moscow State Conservatory, has already developed a notable reputation and promises to go far. Right along side her is Jonathan Burton’s Cavaradossi, with an elegant tenor that rises to its peaks without piercing the ear, penetrating its sleekly precipitous formations with care and grace. His arias E lucevan le stelle (And the stars shone) and O dolce mani (O sweet hands) in the third act are intense and spectacular. Daniel Sutin’s Scarpia, a role with current overtones of manipulative sexual evil, is rippling and full, and his role is indeed as deeply contemptible as his rich baritone is appealing. 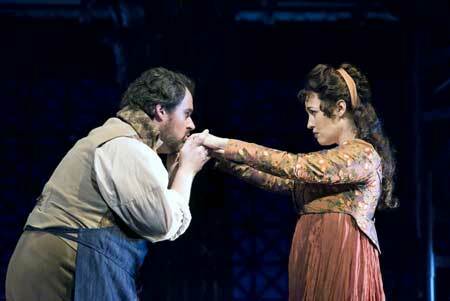 David Cushing’s convincing Angelotti does not have a lot of time onstage but his voice is rich and compelling. Notably outstanding, as well, is David Stern’s leadership of the orchestra. The gesture and nuance are apparent throughout, evoking rhythmic swirls of lyricism at every turn. Because of the need for more expansiveness and room than the pit of the Cutler-Majestic would allow, the orchestra inhabits a space on the set above the action with Stern transmitted on TV screens for the singers. It all seems to work very well, and the levitated orchestra is an unusual but very nice touch. Cello and violin solos in the second part are distinctively evocative. It is nice to see the baritone James Maddelena, long familiar to Boston audiences, in the role of Sacristan, which he performs adeptly, and with a vocal contour that is appropriate for the role of aging cleric.